LANDMARK SETTLEMENT REACHED IN THE DENVER HOMELESS SWEEPS CLASS ACTION!! 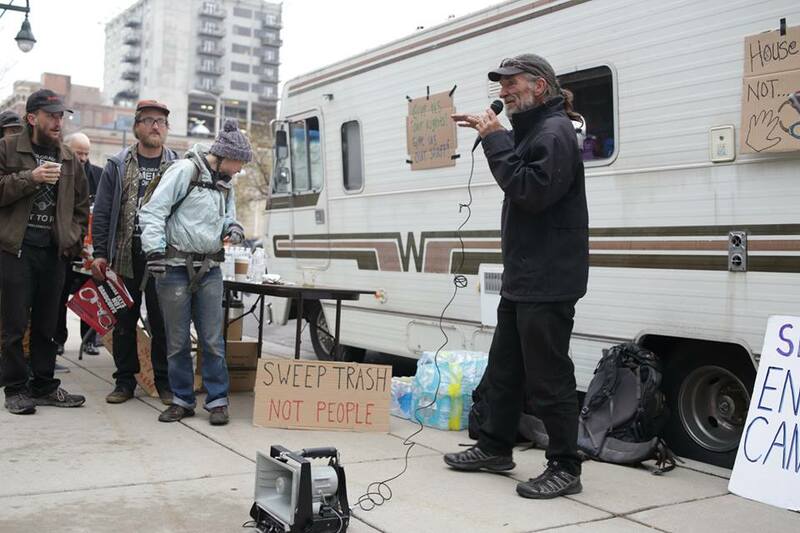 Denver, CO—A landmark settlement has been reached in the Denver Homeless Sweeps Class Action. After almost three years of litigation, the parties have forged an innovative agreement that will be an impactful step forward in protecting the rights and dignity of people living homeless in Denver. This class action lawsuit regards the 4th and 14th amendment constitutional rights to one’s property violated in sweeps where homeless people’s property has been seized. The settlement in this case creates policy to defend basic property rights of people living without housing. It gives every homeless person the right to have their property in public space without being subject to seizure by the City without due process and adequate notice. The settlement spells out detailed policy for how notice must be given, how property can be retrieved, and how the city will be held accountable to these policies. In addition to protecting property rights of homeless people, this settlement creates a number of resources for homeless people in Denver including but not limited to lockers, trash cans and increase trash servicing, porta-potties, mobile health unit, better access to Recreation Centers for showers, and more. The settlement also requires the City get input from homeless people at periodic meetings before making changes to the resources in this settlement. The settlement will go through a court process before becoming official. If you are a class member (aka homeless person) your voice can be heard. A press conference will be held with member of the plaintiff class prior to the Final Pretrial Conference at the US District Court of Colorado this 1pm this Friday, March 1, 2019. After almost three years of litigation, all issues relating to trial will be addressed at the final pretrial conference on March 1st. Prior to the hearing there will be a rally with speakers, food and more outside the courthouse. Homeless Plaintiff Class members will speak about the violation of their constitutional rights in the City of Denver. The lawsuit is against the City and County of Denver for violating homeless people’s 4th and 14th amendment rights when conducting sweeps and seizing people’s property. Evidence has been brought in this case over the past 3 years showing an ongoing practice by the city of sweeps where homeless people’s property is seized. Due to the cities violation of constitutional rights the City has spent great amounts of money litigating this case. The City will continue to face the possibility of more lawsuits if they continue to violate constitutional rights. Trial is set to begin March 19, 2019. Stay tuned. Democratic Party of Denver Endorses Denver Right to Survive Initiative!!! Denver, CO — The Democratic Party of Denver officially endorsed the Right to Survive Initiative today, voting in favor of supporting the initiative by over 70%.